We are sitting on the floor in a simple outhouse room attached to the Afghan Peace Volunteer’s compound, the unheated space is normally used for teaching local children various classes. Habib and his mother Mariam sit in front of us motionless, Mariam wears the burqa so it is not possible to read her face and ascertain how she might be feeling, the tentative expression on Habib’s face tells us that their life is hard. 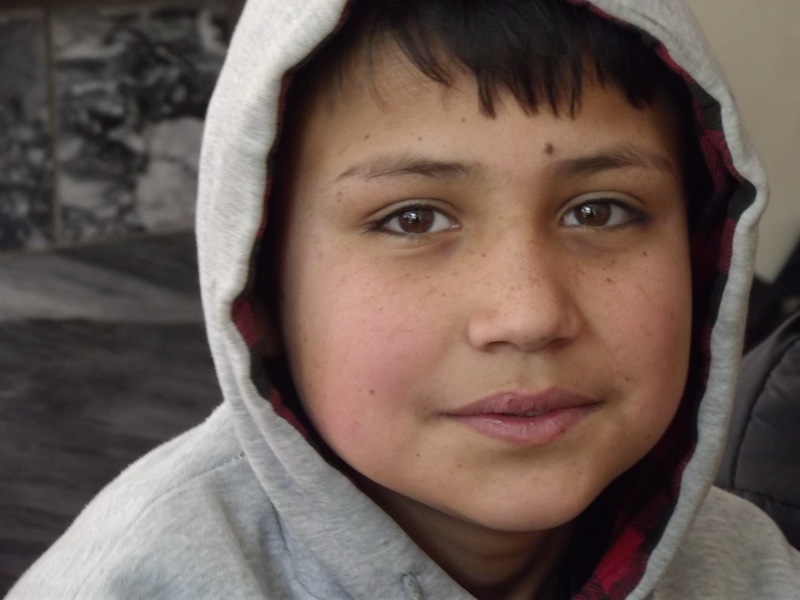 It was around 2 months ago when I first met 12 year old Habib, he arrived on the doorstep with some of his friends wanting to join the Street Kids Project being run by the APV- an effort to help some of the 60,000 street kids of Kabul. Habib’s face looked concerned as he clutched his weighing scales- the tool of his trade- 5 Afghanis a go, around 5p. Since then I have bumped into him a few times. Once outside our local bank- it was the first day of snow and he sat in the doorway shivering, his scales by his side, his ragged thread bare clothes offered small benefits to the freezing cold. I then saw him a few weeks later with his friends, who also work the streets, they were playing tag by the river, their faces beamed with exhilaration as they ran up and down a small unpaved road. Habib is the oldest of 5 children, he’s around 12 years old and in 6th grade, he has 3 brothers and one sister, one of the younger brothers also works the streets. As the breadwinner of the family he starts work with his scales at 8am and finishes around 12 noon, on average he earns around 100 Afghanis a day, though sometimes it’s less. After work he returns home to help with household chores, sometimes he helps his neighbours and whenever he gets the chance, he studies. Habib’s Mother bought the scales for him, initially they borrowed a set from a friend who suggested that line of work for Habib, when it proved to be a good income she bought him his own scales for 350 Afghanis. Habib sits next to his mother Mariam, his face combines sorrow and concern, understandable for a 12 year old who is the main provider for the family. His mother Mariam is 26, a widow of 3 years after a bombing at the local Shia Mosque killed her husband. He was pushing a cart of oranges when he momentarily stopped outside the Abdul Fazal Mosque and a suicide bomber detonated deadly explosives, over a hundred people were killed. He was rushed to hospital but died after 3 days. The outline of Mariam under a burqa is barely recognisable as a person, the all covering indigo cloth makes her human figure almost alien, the only visual human characteristic are her eyelashes which i can faintly see blinking rapidly behind the gauze. It is just her sorrowful voice which allows us to connect as humans. She explains that her brother has a bad temper and doesn’t allow her to work as to do so would be indecent for a young woman, however he himself does not provide for the family, 12 year old Habib does. Thankfully her mother also lives with them, she helps out financially by washing clothes. Mariam was also at the Mosque on that fateful day, she endured injuries which have yet to heal- she requests the men in the room turn away as she lifts up her burqa to show a scar on the left side of her chest. It’s strange to suddenly see a flash of intimate human flesh when I haven’t even seen her face. She doesn’t go into detail but her health is bad and she lives with daily pain. I ask Habib if he had one wish in the world what would it be? With his scales resting on his lap and a thoughtful gaze he replies that when he grows up he wants to become a doctor. We ask Mariam the same question; she wishes for peace and security to come to Afghanistan so her children can be educated and nurtured. She says that living in Kabul the current main dangers are suicide bombings. She then explained how she lost 2 brothers, one during fighting at the time of Naji Bula and the other, who was a casual labourer, mysteriously went missing- he was out walking the streets of Kabul one night when he suddenly disappeared. The family looked for him, they even searched the prisons but he had vanished, they never received word or news of him again. Mariam’s mother lives with the daily sorrow of her two lost sons, there isn’t a day that passes where she doesn’t feel distressed. She would like to locate her son’s body and lay his soul to rest. I hear more about the lives of 26 year old mother Mariam and her 5 children who exist under a piece of tarp attached to the side of a building, their homestead is amongst the most humble of any in Afghanistan, no running water, no heating, the most basic of cooking facilities. Mariam ends by saying she is grateful that Habib is on the APV Street kids project- a scheme which is helping 21 local street children by providing each family with a 25kg sack of rice and a tin of oil every month for a year. The children also attend a weekly class which provide basic literacy and numeracy skills, all led by teenage members of the APV. Mariam says she feels frustrated that she can not offer her son more opportunities in life so is thankful that this project gives him the chance to learn.